The Funeral Cortege for Mrs Paula Maria Cope of Yanchep will arrive at PINNAROO Valley Memorial Park, West Chapel for a Cremation Service on THURSDAY (18.4.2019) commencing at 10am. Deepest sympathy to Neil, Jack, Ben and Carly. Words cannot express the sorrow we share with you all. Thinking of you. Deepest sympathy to Neil and family on the loss of Paula. Deepest sympathy to Neil and children Jack, Ben and Carly on the sad loss of your wife and mother, Paula. Thinking of you all at this time. Uncle Peter, Aunty Sandra, Lara and Arren and families. Our heartfelt sympathy goes out to Neil and all the Cope and Barone families on the sad passing of Paula. She was a much respected friend of all the Dunn families. At Peace. Deepest sympathy to Neil, Jack, Benny and Carly on the sad loss of your beautiful mum. Our thoughts are with you all. Andy Andros and family. Deepest sympathy on your sad loss. 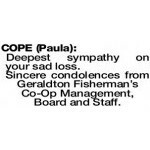 Sincere condolences from Geraldton Fisherman's Co-Op Management, Board and Staff.